The Employees Provident Fund Organization (EPFO) managing by Central Board trustees and Employee Provident Fund Scheme under Employees’ Provident Funds and Miscellaneous Provisions Act 1952, EPF is a scheme which is useful for all the employees and maintained by EPFO, under this scheme of Employee Provident Fund (EPF) an employee should have to pay a certain contribution towards the scheme, equal contribution is paid by the employer. It is mandatory to register all small companies and large companies having more than 20 workers or employers, the employee gets lump sum amount by the retirement of an employee, EPF gets the amount of 12% in your salary by every month and it is transferred to different sectors such as pension and etc. There is no tax for the Employer contribution. The interest earned and the money you withdraw after the specified time is free from Income Tax. To download EPF passbook and for inquiry of EPF balance and etc.., purposes UAN will helpful, This UAN is nothing but account number (universal) and it is abbreviated to Universal account Number and this UAN is being allotted by EPFO a UAN consists of a 12-digit number and also called as Unified Portal. Initially UAN has allotted 4.17 crores EPF Members IDs, it is constant means It doesn’t change with the change in works of an employee, you can link your multiple provident fund accounts into one universal account. Some documents are required to generate UAN they are – Bank details such as account number, IFSC code, and branch name. Passport, Aadhaar card, PAN card, Ration card, Driver’s license, ESIC card. Log on to the EPFO website https://unifiedportal-mem.epfindia.gov.in/memberinterface/. Then select the option ‘Know Your UAN Status’ as shown in the below picture. And then it redirects to a page then enters the details such as PAN card, Aadhaarnumber and then click submit then you will receive an authorization pin or OTP. Then enter iton space provided for OTP entering. Then status of the UAN will be sent to the employee’s mobile number via message. Then it will send a onetime OTP pin to enter it on OTP box then select I agree to terms and conditions option and submit the UAN activation form, detailed information about UAN Activation process given below. Then Click ‘Activate your UAN’ option below of EPF India login panel. You will be able to activate your UAN only after reading the instructions to UAN Activation, to read instructions click on instructions link as shown in the below picture. After reading the instructions click the checkbox ‘I Have Read and Understood the Instruction’. Then enter your UAN number, mobile number, and PF number and fill the remaining details as shown in pic. Enter the Captcha then Click ‘Get PIN’ then it will sent OTP to your registered mobile number. Then click or put tick on ‘I Agree’ by clicking check box then click ‘Submit’ button. Open dial pad and enter 7738299899. And clock on Send an SMS through registered mobile number. And type message format as EPFOHO UAN ENG. The last three letters ENG is the first three characters of the preferred language. It is easier way to activation of EPF UAN account and no use of internet to activate UAN by this process. It’s just giving missed call to 011-22901406. This facility is only for already registered employers in UAN at epf India portal. Give a missed call to it from your registered mobile number. After that, you receive a SMS having your PF details. UAN allotment is very simple process, here is the brief description about ‘Direct UAN allotment’, in first step open the UAN official portal and then click on ‘Online Verified Aadhaar UAN Allotment’then a page will opened displaying ‘Enter Your Aadhaar Number’then enter your aadhaar number and click on ‘Generate OTP’ then a OTP will be sent to your mobile and enter the given OTP in given box then click on submit button for further move. A page will be opened displaying Basic Details available against the Aadhaar entered by the user, then Then verify the details and enter the necessary data in mandatory fields and then click on check box in disclaimer section then click submit button by entering Captcha provided, on clicking submit button a message will be displayed on the screen for example ‘your UAN Allotted’ message will be displayed like this. Open the given link (https://unifiedportal-mem.epfindia.gov.in/memberinterface/) on your web browser. Then click on the link ‘Online Verified Aadhaar UAN Allotment’below login panel. A page will be opened as given below picture. After Entering of Aadhaar Number click ‘Generate OTP’ then aOTP will be sent to his/ her registered mobile number only. On entering the OTP at OTP allotted box and then click on check box accepting the Disclaimer provided, after entering all the details Submit Button will be enabled then click ‘Submit’ button. After hitting submit button it moves to further step displaying Basic Details available against the Aadhaar entered by the user. Then verify the details and enter the necessary data in mandatory fields and then enter the Captcha provided and click on the check box in disclaimer section then click on register button. By clicking the ‘Register’, UAN will be allotted and then, will be displayed as message to the user in the screen. EPF Passbook download and EPF Balance check through online. EPF Balance checking via SMS and Missed Call. EPF Passbook download and EPF Balance check through UMANG Mobile App. Open the given web portal https://passbook.epfindia.gov.in/MemberPassBook/Login.jsp. Login with necessary details such as login and password. After logged in select the Member ID to view passbook. After selecting you can download total passbook details in the form of PDF. And check the details and what transactions you donned. The EPF balance checking via SMS and Missed call is same as above explanation in UAN activation. This process is only for UAN activated members. If you want to check PF balance through SMS gives a SMS to the EPF Balance check SMS number 7738299899 by your registered mobile number, after a while you will receive SMS code having balance details. If you want to check PF balance through missed call, just dial to 011-22901406 from your EPF Account registered mobile number, then it will send message having all details about balance. Open the https://web.umang.gov.in/web/#/ URL in your web browser. You will see get it for Android click on it as shown in the below picture. It will redirect to play store and then click on install. And fill the page with necessary details such as login (UAN AC Number) and password. After login, you will find passbook and check balance details option and then click on it. Download the passbook from on it and then check the balance of your PF account. Download EPF passbook monthly, yearly, all time. Check EPF pension status and amounts. Open the EPFO official website ‘https://epfindia.gov.in/’. Then click on ‘For Employes’ under ‘Our Services’. Then click on ‘inoperative A/C Helpdesk’ under ‘services’ section. On clicking on inoperative A/C Help desk, a page will be displayed read the instructions and then click on ‘First Time User’. On clicking ‘First Time User’, it will display a box asking ‘Enter Your Problem Here’ then enter your problem there and then click on next option for further procedure, as shown in the picture. On clicking on Next button, a page will be displayed with a large form fill the form with necessary details and then click on ‘Next’ button for further details. On clicking ‘Next’ button another page will open containing same form with extra an different details after filling all details click on ‘Generate OTP’. Then a OTP will be sent to your mobile number then enter the OTP in space provided, then it will give a reference code remember it to track your request. Open the official website ‘https://epfindia.gov.in/’ as same as the above process. Then go to ‘For Employees’ then click on inoperative A/C Helpdesk account as same as above process. Then scroll down to bottom of page click existing User. Then login with necessary details such as Reference Number and Mobile Number. After logged in you will see the status of your EPF. On clicking forgotten password, a page will be displayed asking ‘enter mobile number and DOB’ then click submit. Once your account is traced they will sent status details via SMS to your registered mobile number. Documents required for KYC Update – National Population Register, AADHAR, Permanent Account Number, Bank Account Number, Passport, Driving License, Election Card, and Ration Card. Here you can change not only KYC and aadhaar but also name DOB etc.., the changes will be appeared after approving changes by the UAN employer. Login to EPFO UAN account by UAN number and Password. After logged in, click on ‘KYC’ under ‘Manage’ section. In you will find manage drop-down menu in menu bar click on it and then go to ‘KYC’ then a page will be displayed showing all details. Select the KYC information in which you to update from the list then click on update. Until details are approved by the employer the status of KYC will be shown as pending. Once your employer approves the changes, status will be changed as “Approved by employer”. And you will receive SMS by displaying Approved by Employer. Link of EPF UAN Aadhaar is same as above process just follow it. After logged in you will find manage drop-down menu in menu bar click on it and then go to ‘Modify Basic Details’ then a page will be displayed showing details about DOB and name etc. Then change the details which you want to change then click on submit button. On clicking submit the screen will be displayed with a table showing pending request. As you know that until details are approved by the employer the status of details is modified by you will be shown as pending. All request made will be rejected due to miss match with the details. Small miss-match may stop the transfer process. There will be complications in the claim process when the mistake in nominee details. So please check once again when you are filling EPF forms and if there is any mistakes clear it, otherwise it will makes more problems to you. Unemployed for a period of 2 or more months. 3 Purchase of land / construction of a house For land upto 24 times of monthly wages. Marriage – For the marriage of self, son/daughter, brother/sister. Education – For the education of his children. Land/house Purchase – land or the house should be in the name of both the employees. Home repair – The employee should have more than 10 years relation with EPFO A/C and Service Employee can avail this facility only once. Before retirement – it is up to employee decision(For himself). Medical treatment – in case of TB, leprosy, paralysis, cancer, mental derangement or heart this loan will be allotted. First of all apply for members have to apply housing society in the prescribed format to the Commissioner. Specifying balance in PF and monthly contribution from last 3 months to the commissioner to issue the certificate. Then get PF passbook print from official website. EPFO do not associate with builder or house agency. Due to lump withdrawal amount members can full or half repayment of loans without monthly contributions. The members who have monthly income less than PMAY (Pradhan MantriAwasYojna), don’t have to own house at any were in India. Form 13 – at the time of job changing Form 13 is very useful to transfer PF account from your previous employer to the new employer. Form 14 – It is useful when the employee want to apply for Life insurance Policy. Form 19 – The form 19 help to withdrawal fund taking retirement from the job or when employer leaving his job. Withdraw PF Balance from EPFO regional office using Form-19. The employer who want to withdraw his PF amount or transfer the PF amount to another person have to fill Form 19 in your regional EPFO office and attested to verify with attaching proof to it by your EPFO bank manager or post master or gazette officer and then employer will receive the PF amount after three months from the submission date at the bank. Log on into UAN portal. 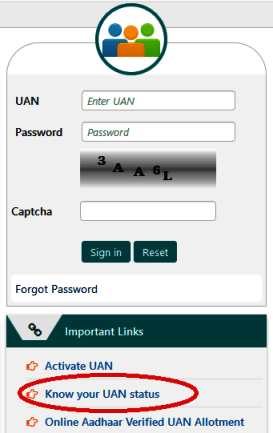 Then login into your UAN A/C with proper UAN number and password. Then once check your KYC details (manage menu>KYC) are correct or is there any mistake, if there is a mistake clear it. And check basic details of you and then go to ‘Online Services > Claim’. On clicking on clime option a page will be displayed with claim and KYC details as given below picture. Then click on proceed claim to submit your claim form. Then click on ‘Our services’ on menu bar then go to ‘for employees’. Then refer the services details and make a click on ‘know your claim status’. On clicking on ‘Know Your Claim Status’ a page will be Displayed asking UAN number and captcha enter the necessary details in the boxes and then click on search option for further process. On clicking on search a page will be displayed with claim status link. Then enter the state of your PF office and then select your PF office from the list displayed. And enter A/C number then click on ‘submit’ to know PF claim status. 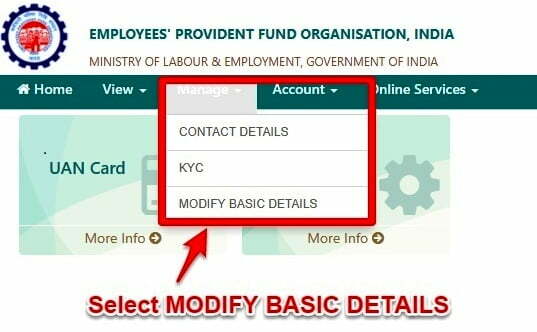 Linking of Aadhaar to EPF UAN account is an important KYC contains your name, DOB, Gender, age and your photo. With this aadhaar you can link multiple UAN accounts to single UAN account, used to reduce documents to upload at EPFO portal. And these are the major benefits of linking aadhaar to EPF UAN account. 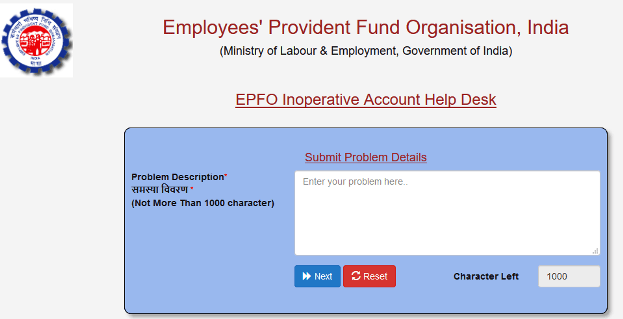 Open the EPFO official web portal ‘http://www.epfindia.com/’. Then open ‘ekyc portal’ under ‘Online Services’ section. Or open the link ‘https://iwu.epfindia.gov.in/eKYC/’. In 2nd section click on ‘Link UAN Aadhaar’, then a page will be displayed with a small form where you need to fill UAN number and mobile number fill the details then click on ‘Generate OTP’. A OTP will be sent to your registered mobile number and enter OTP and Aadhaar Number in specified field then click on ‘submit’ button. Visit ekyc portal as the above process. And as you know that ekyc portal having two sections one is for field employers and second one is for members. Then click on track ekyc on members section. Then enter your UAN number and then make a click on ‘Track ekyc’ button. Then the portal will show your ekyc status. EPFO recently launched the ‘One Employee – One EPF Account’to merge multiple accounts accounts into single account, it is easy to maintain multiple accounts at a time this is also called as Umbrella because now EPFO has a decentralized system so now the EPF accounts are handled regional PF offices. And this makes easy to track all your old EPF accounts and UAN is future for EPF. Then click on ‘For Employees’ under ‘Our Services’ section. Then click on ‘one employee – one EPF account’ under ‘our services’ section. Then a page will be displayed with a form, fill the form with necessary details and then click on Generate OTP. An OTP sent to your registered mobile number an then enter it in specified field. Then accept the declaration and then click on submit request. This facility is provided by EPFO to the employees who forgotten their passwords and problem in their passwords, here detailed procedure to reset your password open UAN official portal and then click on ‘forgotten password?’ then a page will open enter UAN number and Captcha, then click on generate OTP, then a OTP will be sent to your registered mobile number enter that OTP in OTP box. Then it will ask change password and then enter your new password. Make a click on forgotten password then enter UAN number and Captcha. Then click on generate OTP, an OTP will be sent to your registered mobile number. Enter the given OTP in OTP box. Then a page will be redirected displaying Enter new password. Enter your new password then click on submit. Your password will be changed successfully. Public Provident Fund shortly called as PPF. It is a savings instrument and it is introduced by National Savings Institute of the ministry of Finance in India in 1968 and this scheme is granted by Central Government of India. PPF is a long-term investment plan and it is mainly for self-employed people in India. The main aim for introducing this scheme is that to transfer the savings by their investment with reasonable returns and income tax benefits. Even minors can apply for a PPF account. In EPF withdrawal will attract tax. Whereas no premature withdrawal is allowed in PPF. PPF is 15 years Scheme and you will increase by 5 years manually. It depends on the term of employment of the account holder. PPF is tax free when interest is received. Tax deductions are eligible in EPF. NRI’s (Non Resident Indians)are not allowed to advance money in Public Provident Fund. Minors (less than 18 years old) are eligible to open an account by their legal guardian. People cannot be open the PPF account under the name of Hindu Undivided Family (HUF). PPF account Closing after the 15 years (completion years). Extend PPF account without further contribution. Attractive interest rate of 7.6% (without tax under Section 80). Long term investments of 15 years and extending features for 5 years. Deposit Amount as MIN Rs.500 and Max Rs.150000 in one year (Financial Year). Maximum in 12 transactions of deposit transactions can be done. Between 3rd and 6th financial years lone can be availed. From 7th financial year withdrawal facility will be available. The account can be extended for 5 years after 15 years (validity Time). One deposit minimum 500 for one financial year. No age restriction for opening PPF account. Account can be activated by min deposit of Rs.500/-. Visit any bank neared by you and while visiting bank for PPF account opening carry the documents given in this article in top of the page such as pan card, aadhaar card and etc.., for verification purposes. Once verify all documents are correct or not. Then fill the form to open PPF account with necessary details such as pan card Xerox etc.., and one latest photograph of the user. Once formalities are finished you will receive a passbook as same as bank passbook. All transactions in the PPF account are updated in this passbook. An important thing is that the payee name should match the name as mentioned in PPF account form. Minors are eligible to open an account by their legal guardian. 7.8% Per Annam is the current interest rate from 2017-18, interest should be paid 31st march on every year. PPF account opening through bank. PPF account opening through post office. Open https://www.onlinesbi.com/ in your web browser. Once you logged in into your SBI A/C then you will find the ‘New PPF Account’ option under the ‘e-services’ section drop-down and click on it. You will find details including pan card and etc.., in New PPF account page. By this facility SBI customers can also open a PPF account in the name of minor. Then enter the branch code, once you entered branch code in specified field the portal will automatically displays branch name. And then enter the nominee details and hit submit button. On clicking submit button you will receive a reference number. Please print out account opening form, and visit SBI bank neared by you within 30 days. And remind that online application deleted after one month from Applying from online. For customers who have a relationship with SBI Bank that is less than 5 years have to carry Form A, Passport size photograph, Copy of PAN card and for customers who have a relationship with SBI Bank that is greater than 5 years have to carry extra one document Residence proof – Passport/ Electricity Bill. NRI’s are not allowed to advance money in Public Provident Fund.